Ever hear a record that was so ferocious it was almost intimidating? And I'm not talking about sheer brutality or heaviness, but in speed and raw anger. If you haven't then Aberration Nexus's debut release Libro Lacet is the record for you. A raging black metal release that harnesses an unholy ferocity this is yet another great black metal release in a year that seems to be full of them With symphonic fringes and a undying dedication to the genre Libro Lacet is an addictive listen to say the least, stimulating my black metal heart into an undying and manic rage. 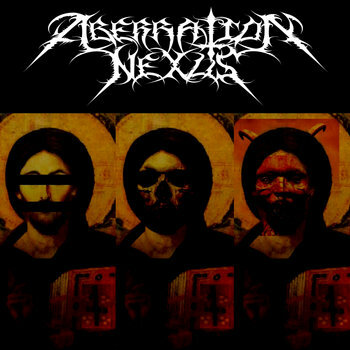 One of the first things that will strike you about this first release from Aberration Nexus is the way the doomy keyboard lines mesh with dark guitar parts. It all is part of the generally great songwriting, this is the kind of thing that not only showcases a certain sound, but also a musician. Chris Meyer, the genius behind Aberration Nexus, certainly seems to have his own clear musical style, no band in the world is really making music like Aberration Nexus is. Note though, influences from acts like Inverted Prophet are heard in the compositions and the lyrics often reflect the ideas of Chuck Schuldiner. In short, Libro Lacet is remarkably developed for a black metal debut, the kind of thing that reaches out and grabs the hearts of thousands of listeners. Aberration Nexus has a clear artistic direction and these five tracks are not enough to demonstrate all that Chris Meyers is capable of. Meaningful and powerful I am very excited to hear more from this guy. One of the best black metal debuts I have heard in years. It is simply fueled by an incredible ferocity, the kind of thing that suggests the music will never die, but only rise again, harder and stronger, more evil than ever before.